Phone poll asks: would you vote for the NDP led by David Eggen? 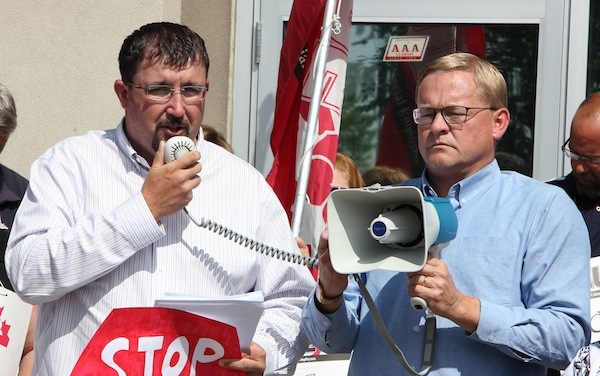 NDP MLA David Eggen (right) helping out first-term Wildrose MLA Ian Donovan (left) at one of his colleague’s first protest rallies as an MLA. 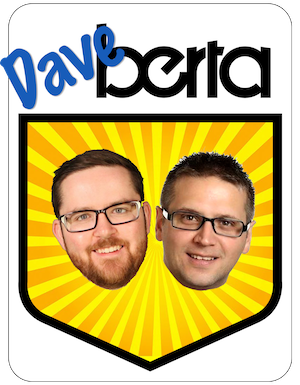 Is there an undeclared race underway to become leader of the Alberta NDP? An interactive voice response poll calling Albertans on February 11 suggests there just might be. The automated phone poll conducted by the Toronto-based Research House began with innocuous questions aimed at gauging opinions about the current Progressive Conservative government and other political party leaders, but it soon shifted toward questions about the NDP leadership. First asking for the approval or disapproval ratings of Edmonton-Strathcona NDP MLA Rachel Notley and Edmonton-Calder NDP MLA David Eggen, the auto-pollster then questioned whether they would vote for an NDP led by Mr. Eggen. It has been suspected for months that current NDP leader Brian Mason could retire before the next election (he has served as leader since 2004), but, if this is a legitimate poll, this may be the first public evidence we have that his potential successors are testing the waters… or kicking-tires. A teacher and public health care advocate, Mr. Eggen served his first-term as MLA from 2004 to 2008 and returned for a second term in 2012. Both Mr. Eggen and Ms. Notley are experienced opposition MLAs and would be formidable candidates for their party’s leadership. The NDP last held a contested leadership race in the mid-1990s. This entry was posted in Alberta Politics and tagged Alberta NDP, Brian Mason, David Eggen, Edmonton-Calder, Edmonton-Strathcona, Ian Donovan, Interactive Voice Response, Leadership race, Poll, Rachel Notley, Research House on February 12, 2014 by Dave Cournoyer. So? What number did you press? Too bad the NDP is out of step with the average Albertan. Now the fourth party, the next step is out the door. Interesting. I was asked by this poll if I would support Rachel Notley. Different questions based on my answer to some earlier question? I would vote for the NDP no matter WHO was leading the party….if they gave me a candidate who was credible. Unfortunately, they have a tendency to put up weak candidates against Laurie Blakeman…probably because she’s a pretty strong constituency representative…and not that far afield from the NDP in any case! Blakeman is the worst MLA in the whole legislature. No idea why people keep electing her. I don’t think anyone is excited about the NDP. Eggen doesn’t change that problem. So, you wanna talk about the PCs calling their taxes user fees? Fine. You call your bigoted gatekeeping, greenwashing, government ‘intersectional,’ as though where was anything intersectional about making it harder for trans women to get estrogen than cis*women an abortion, or exporting the health risks of our fossil fuel industry to poor kids living in Bangladesh. A queer trans woman who was a closeted kid in a GSA expected to play ally, and who has seen the long-term data.